Fee includes museum admission. Adults attend free with regular admission. Kids and families learn to use tools, experiment with different types of making, and think creatively in PlayHouse Maker Workshops! This program is designed for kids 3-12 years old. All children under 8 must be accompanied by an adult. Registration is required and closes the Wednesday prior to the workshop. 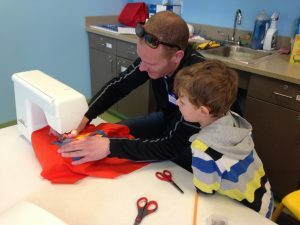 Learn some basic sewing machine skills in this fun workshop, where you can make your choice of a pillow or tote bag that shows off your unique style. PlayHouse Maker programs are made possible in part by the Institute of Museum and Library Services.